Hydrogen fuel cells would be just about the most wonderful power producers in the world if they weren’t so expensive and so finicky about their diet of hydrogen. Their catalysts, usually made of costly platinum, can be destroyed by impurities in the gas. Making high-purity hydrogen is an exacting task and adds to the expense of operation. Two studies by scientists at the U.S. Department of Energy’s (DOE) Brookhaven National Laboratory; one in conjunction with researchers at South Korea’s Ulsan National Institute of Science and Technology (UNIST), Korea Institute of Energy Research (KIER), show that it may be commercially possible to make less expensive catalysts with available materials, and in one case, use “dirty” hydrogen that would otherwise destroy fuel cells. The reduced price of making such hydrogen would further add to operational economies. Green Car Congress reports that Brookhaven and UNIST have discovered, “a new family of non-precious metal catalysts based on ordered mesoporous porphyrinic carbons (M-OMPC) with high surface areas and tunable pore structures. Porphyrins are any of a class of heterocyclic compounds containing four pyrrole rings arranged in a square.” These orderly, porous materials are said to give better performance than platinum while costing 1/10th as much. 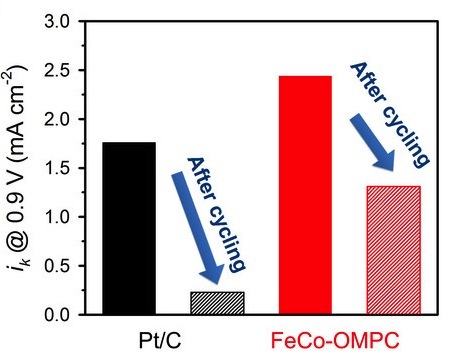 Comparison of kinetic currents of Pt/C and FeCo-OMPC catalysts before and after 10,000 potential cycles. The materials, discussed in an open paper in Scientific Reports, reportedly react more strongly to produce an oxygen-reduction reaction (ORR) than platinum, a potential cost-reduction factor in making fuel cells. The catalysts showed very high surface areas, adding to their ability to react with the hydrogen, and also showed a higher potential service life that platinum, with higher ability to produce electrical current before and after 10,000 cycles. Researchers noted that these materials also demonstrated improved resistance to “poisoning” than more traditional catalytic materials. The research was led by Sang Hoon Joo, professor of the School of Nano-Bioscience and Chemical Engineering at South Korea’s UNIST. Fellow authors include: Jae Yeong Cheon from UNIST; Gu-Gon Park from the Korea Institute of Energy Research (KIER); and Radoslav R. Adzic from the Chemistry Department of the Brookhaven National Laboratory. This research was supported by the Basic Science Research Program through the National Research Foundation of Korea funded by the Ministry of Education, the support from Korea Institute of Energy Research, National Junior Research Fellowship, and Global Ph.D. Fellowship. A second study from Brookhaven shows a new catalyst that can produce energy from carbon-monoxide-polluted hydrogen, the kind that comes from the extraction of natural gas. Without expensive purification, it can’t be used in conventional fuel cells. That’s a great loss, since it’s 40-percent less expensive than the pure hydrogen split from water. The catalyst, described in the September 18, 2013 Nature Communications, has a core-shell made from Ruthenium coated with platinum. The material resists damage from CO and its nanoparticle structure keeps the primary materials in perfect order. While a platinum catalyst can “peel” the energy from pure hydrogen, any CO can deactivate the metal. Ruthenium is more tolerant of the impurity, but comes apart during fuel cell startups and shutdowns, losing performance over time. Researchers were able to use ethanol to fabricate the nanoparticle core and shell, keeping the process simple and relatively low temperature. 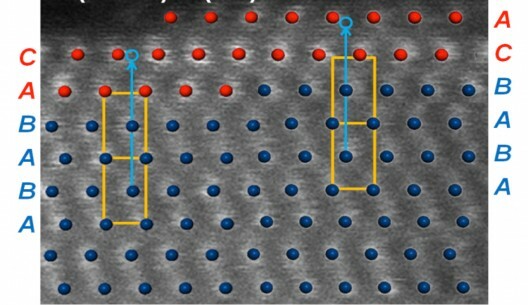 Brookhaven Labs explain, “Computational model optimized with Density Functional Theory superimposed over a high-resolution scanning transmission electron microscopy (STEM) image (white dots). Ruthenium retains its structure with ABAB stacking sequence (blue dots) in the core, and the platinum shell switches to the distinct ABCABC stacking sequence.” This helps match practice with theory. Brookhaven scientists had great cooperation from their Lab’s National Synchrotron Light Source (NSLS), which allowed them to map the core and shell structures and make sure reality matched theoretical models. Using density functional theory (DFT) calculations, scientists could use computers to help “identify the most energetically stable platinum-ruthenium structure”. 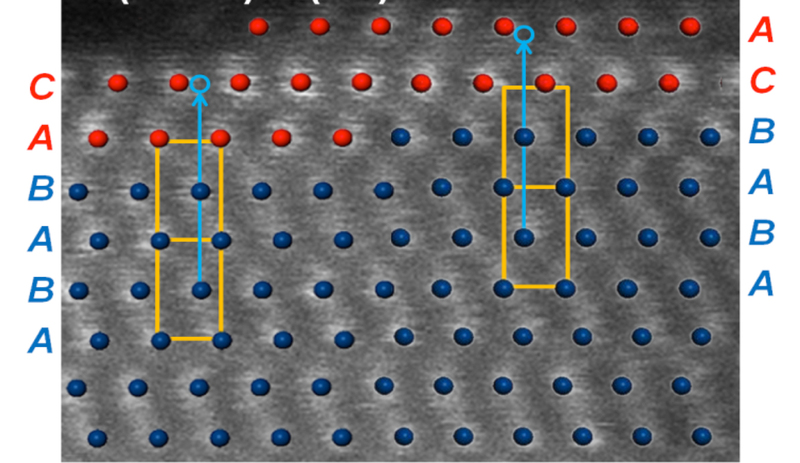 “The DFT analysis connects the dots between performance and configuration, and it corroborates our direct observations from x-ray diffraction and electron microscopy,” Adzic said.